Mix Masa harina and warm water in a medium-size bowl and knead until you have a uniform texture. If the dough feels dry, add more water, little by little, spoon by spoon, until the dough is soft and manageable, like play dough. It doesn’t have to be sticky. If you live in a place with lots of humidity, the dough won’t need too much water. If that's not your case, make sure the dough has enough moisture to avoid any cracking on the sope's surfaces. Now, cover the dough with a wet kitchen towel; this will help to keep the dough moist. Always keep a small bowl of water next to your working area to keep your hands and the dough moist. Divide the dough into 10 pieces of the same size, cover with the kitchen towel. Heat the griddle to medium-high heat. To form the sopes, cut the plastic bag into 2 squares of about 6-IN each. Place one piece of plastic on the Tortilla press, then put down one of the small balls of dough and cover with the other piece of plastic, close the tortillera and press down gently with the tortilla press handle until you form a medium size thick tortilla. of about 4-1/2 inches. Lift the handle and remove the top plastic. Pick up the tortilla, holding with the plastic at the bottom, gently flip the tortilla to unto the palm of your hand. A large part of the tortilla will cover your hand. If you don’t have a Tortilla Press, use a glass pie dish to press down the dough; I use it all the time and it works wonderfully. Place the tortilla on the already hot griddle/comal, this is a fast but gentle move. Turn the tortilla after a minute, don’t let it cook longer or the dough will dry and crack. Turn again after a minute, and the last cooking will take about 20-30 seconds. Remove from the griddle with the help of a spatula. Cover the tortillas with a dry kitchen towel and allow to cool for about 30-45 seconds, and start forming the border pinching the edges with your fingers. Now, the tortillas had become sopes, cover again with the kitchen towel and keep cooking the rest of the sopes. Heat the oil or lard in a skillet or griddle at medium heat. Place the sopes on the skillet and lightly fry them on both sides (about 30 seconds each side will be enough time to fry them and give them a little golden color). Remove from the heat and place on a plate that has already being covered with paper towels to absorb any excess fat. Now is time to spread the refried beans, top with shredded lettuce, beef, chicken, or any other topping of your choice. Serve with salsa. • If you can’t find Mexican queso fresco or Mexican cream, you can do the following: Substitute the Mexican cheese with feta cheese and even parmesan cheese. For the cream, mix equal amounts of sour cream and heavy cream with a pinch of salt. (I know many people living outside Mexico — like me — who struggle to find Mexican products). 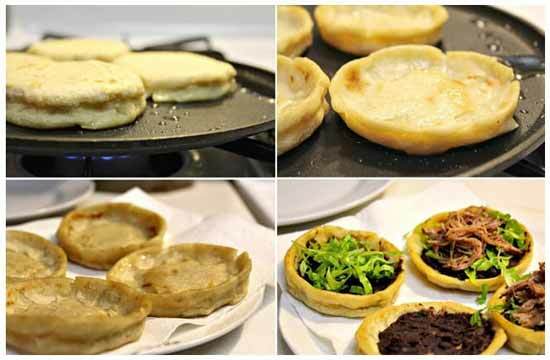 • Making Sopes require certain amount of time and preparation, that’s why is better to make them when you have some leftovers in your fridge, like refried beans and beef or chicken from a stew; that way you will have some of the ingredients ready. • You will need a plastic bag like the ones used to store food in the freezer (to form the sopes), a griddle-comal, a tortilla press or a glass pie dish in case you don’t have a tortilla press (please look picture below).